Layla McCarter came out the winner in her fight against Belinda Laraquente — winning every round on the judges scorecard. Women’s Boxing: Belinda Laracuente to fight Layla McCarter on 8/13! Laracuente and McCarter are both 32 years old with impressive professional careers and lot of time in the ring. The match is a rematch of sorts of their ten-round GBU lightweight championship bout. 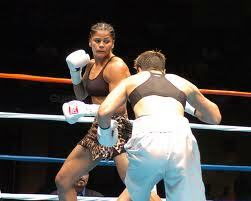 They fought ten hard 3-minutes rounds, the first professional women’s fight to do so, at the Orleans Casino in Las Vegas, Nevada on November 17, 2006. For a preview of their upcoming bout, here are the links to their GBU Lightweight Championship bout! i want to c Layla vs belinda there rematch in d ring.i think Layla will still take d crown again.i want d fight host.